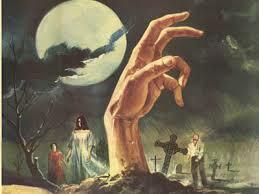 The Land of the Living Dead! For as long as I can remember, I have always been a horror and science fiction fan. Now, while some may see this as a conflict of interest in regard to my Christian faith, nevertheless, through the years I have found that being a viewer of Star Trek and horror movies has provided some good fodder for deep theological illustrations and insights and such is the case with this post. I was reading the Epistles the other day when it suddenly dawn upon me that we are living in the land of the living dead! Let me show you what I’m talking about! In Ephesians 2:1, Paul informed the Ephesians that God had “quickened” (Old English word meaning; “made alive”) them who were once dead in their trespasses and sins. In Romans 6:2, Paul asked his readers: How could they who were; “dead to sin” live any longer in sin? Do you see that? According to Paul, the person who is not saved is “dead in sin” and in a sense “dead to God!” They are physically alive, but they are spiritually dead! On the other hand, the person who is saved is “dead to sin” and alive to God! The saved person is physically and spiritually alive, but is dead to sin! When we were lost, we were dead in sin! Once we are saved, we are dead to sin! Therefore, everyone alive in the world today is, in a sense, a living dead person! The person who is not saved is alive to sin, but dead to God. The person who is saved is dead to sin, but alive to God! We are all, alive and dead at the same time! As a consequence, in this case, truth is stranger than fiction! Now, don’t go home and lock yourself in your closet! The zombies are not coming to get you! But, just know that every day you live; you are living in the land of the living dead! This entry was posted in Exegetical Studies, Teachings and tagged dead, living, sin, spirituality, state of being. Bookmark the permalink.